If you’re ready to glow like whoa, then it’s time to tell the competition to step aside! It’s your turn to Glow All Out™! This Double Dip approved formula creates envy worthy results with its BB cream airbrush finish, coupled with color correcting, contouring agents, cellulite fighters, and tan extending technologies. 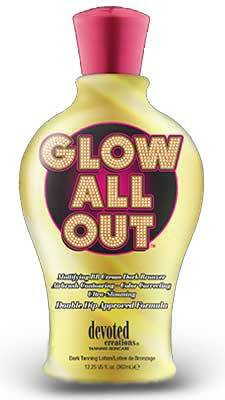 Formulated for those who don’t want to turn heads, but for those who want to break necks... Glow, baby glow! BB Cream priming and perfecting agents. Save 50% Devoted Creations Saltwater and Sundays Tan Extender -18.25 oz.